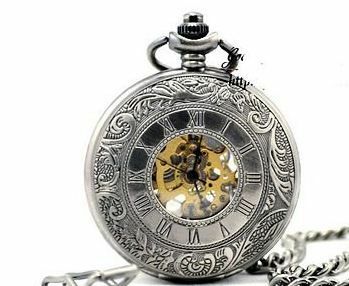 ABP060 - Titanium White Finish Embossed Victorian Style Steampunk Pocket Watch with Roman Numerals. Watch: Just under 2" in diameter. Chain length 31.5".This lovely titanium finish pocket watch pendant with a lovely glass front with Roman numerals and ornate styling is the perfect finishing touch for any Victorian or Steampunk costume. 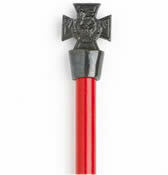 Made of steel metal alloy and finished in antique brass. Watch is functional, but still makes a great costume prop. Beautiful vintage looking watch with modern time keeping abilities.